CINCINNATI and MOUNTAIN VIEW, Calif., Aug. 16, 2018 /PRNewswire/ -- The Kroger Co. (NYSE: KR) and Nuro today announced Scottsdale, Arizona as the city for their self-driving grocery delivery pilot. 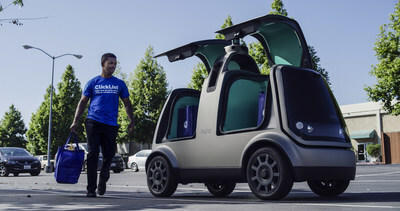 Earlier this summer, Kroger, America's largest supermarket retailer, and Nuro, maker of the world's first driverless delivery vehicle, announced a partnership to begin testing grocery delivery using Nuro's robots. Through the new self-driving delivery vehicles, customers will receive their groceries at their curb – safely and quickly. "Scottsdale is proud to be the home of Kroger and Nuro's partnership," said Scottsdale Mayor Jim Lane. "We welcome innovative technology that can benefit the lives of Scottsdale residents. We feel this partnership holds tremendous potential and promise, and offers our residents real, not-yet-experienced convenience for everyday routines." "We're excited to launch our autonomous vehicle delivery pilot with Fry's in Scottsdale," said Kroger Chief Digital Officer Yael Cosset. "Kroger wants to bring more customers the convenience of affordable grocery delivery, and our pilot with Nuro will help us test and learn to understand customer acceptance of autonomous vehicles in our seamless offering. We thank Arizona Governor Doug Ducey, Scottsdale Mayor Jim Lane, and the Scottsdale community for being terrific partners and for supporting customer-focused innovation." "Arizona is home to some of the most innovative autonomous vehicle testing," said Nuro Co-Founder Dave Ferguson. "We're proud to contribute and turn our vision for local commerce into a real, accessible service that residents of Scottsdale can use immediately. Our goal is to save people time, while operating safely and learning how we can further improve the experience." Click here to access photography and video of the R1 driverless vehicle. At The Kroger Co. (NYSE: KR), we are dedicated to our Purpose: to Feed the Human SpiritTM. We are nearly half a million associates who serve over nine million customers daily through a seamless digital shopping experience and 2,779 retail food stores under a variety of banner names, serving America through food inspiration and uplift, and creating #ZeroHungerZeroWaste communities by 2025. To learn more about us, visit our newsroom and investor relations site. Nuro combines software and hardware expertise to design and build products that accelerate the benefits of robotics for everyday life. Nuro's first product is a self-driving vehicle designed for local goods transportation. The company is led by world-renowned experts in robotics, artificial intelligence and computer vision. Privately held, Nuro powers partnerships with local businesses seeking new ways to cost effectively transport goods and create new experiences for their customers. For more information, visit https://nuro.ai/arizona.